The Third Intermediate Period and the Late Kingdom 1070-332 �.�. During the Third Intermediate Period, Egypt once again fragmented. The Late Kingdom then saw alternating periods of foreign occupation and independence. The pharaohs who followed the 20th dynasty only held sway over the lands of Upper Egypt. The leaders of the Libyan mercenary troops employed by the kings grew in power until one of them, 1 Shoshenq I (ca. 945-924 B.C. ), managed to seize the throne. 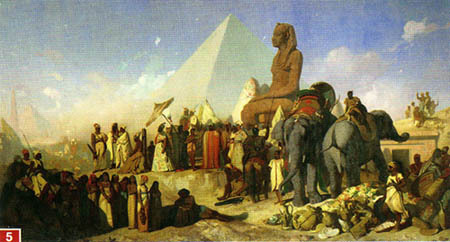 Through their dynastic connections, the Libyan pharaohs were initially able to exert a certain influence in Upper Egypt, but Lower Egypt eventually disintegrated into a multitude of principalities and kingdoms. hieroglyphic inscription, ca. 930 B.C. 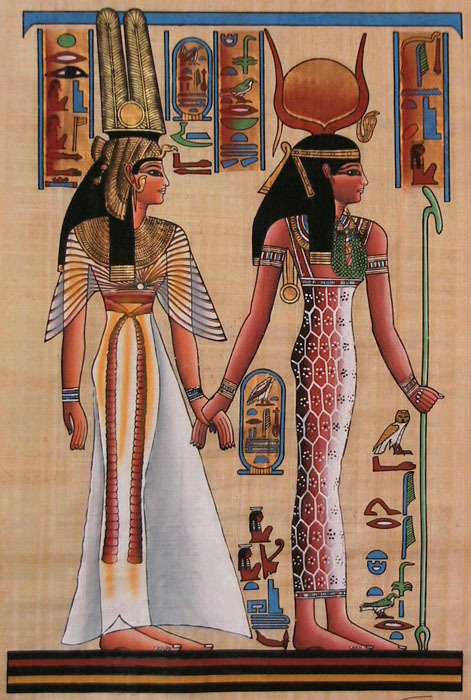 The 2 high priests of Amun, in Thebes, had already established a form of theocracy in Upper Egypt, which they legitimized through the prophecies of the 4 "god-wife of Amun." The functions of this high office were usually performed by the princesses of Libya, and later by princesses from the Kushite roval families. The Kushites began advancing out of Nubia into Egypt in about 740 B.C. 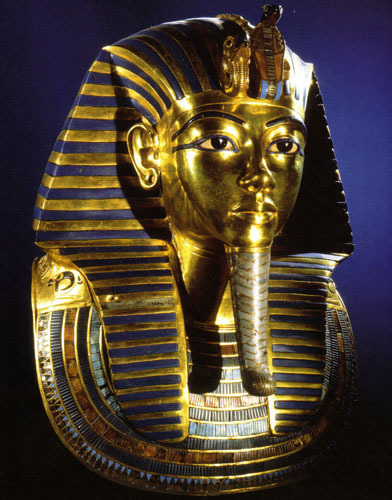 They established themselves as pharaohs, first in Thebes and then, under the 3 25th dynasty, in Lower Egypt as well. They succeeded in establishing a single Egyptian state in 712. After 671 �.�, the Assyrians launched repeated invasions of Egypt. They installed Psamtik I, a Libyan prince from the Nile Delta, as governor. In 663, with the help of Greek mercenaries, he declared independence and founded the 26th dynasty. He forced the Kushite god-wife of Amun to name one of his daughters as her successor and thus brought Upper Egypt under his rule by 656. 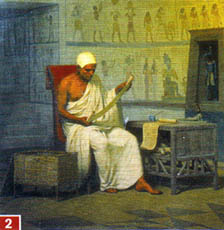 Psamtik I also brought Greek tradesmen to Egypt, who settled primarily in the Nile Delta. Overtime, the relationship with the Greeks became ever closer. The pharaohs married Greek women, donated votive offerings to Delphi, and minted coins after the Greek model. The Persians 5 conquered Egypt in 525 �.�. and incorporated it into their empire. After many uprisings, Egypt regained its independence only to fall to the Persians a second time in 343. When Alexander the Great conquered the Persian empire in 332 B.C., Egypt also came under his rule and he founded the city of Alexandria. After his death Egypt once again rose to a position of supremacy in the Eastern Mediterranean region under the rule of the Ptolemies. Egyptian hieroglyphics were a pictographic script, primarily used on monuments and for religious texts. The Egyptians continued to use simplified forms of hieroglyphics in their daily lives until the time of the early Christians, when they switched to writing the Egyptian language with the Greek alphabet. Over the centuries, the understanding of ancient hieroglyphics was lost. 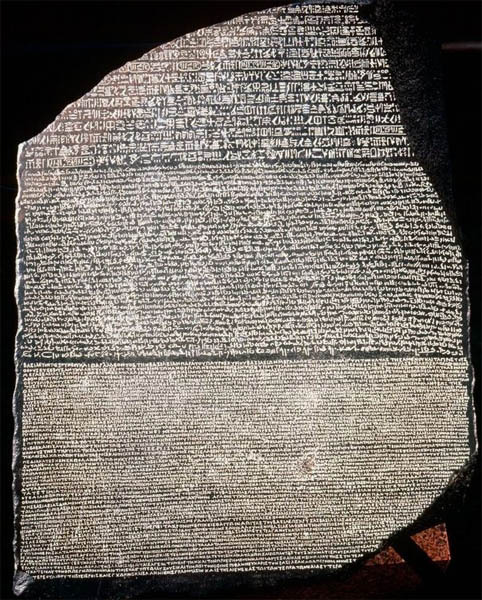 In 1799, a French military officer, who had come to Egypt as part of Napoleon's expedition, discovered the "Rosetta Stone." On this monument from the second century B.C. he found a text chiseled in both hieroglyphics and Greek. With this new evidence, philologists finally deciphered hieroglyphics in 1822. The Rosetta Stone, ca. 196 B.C. 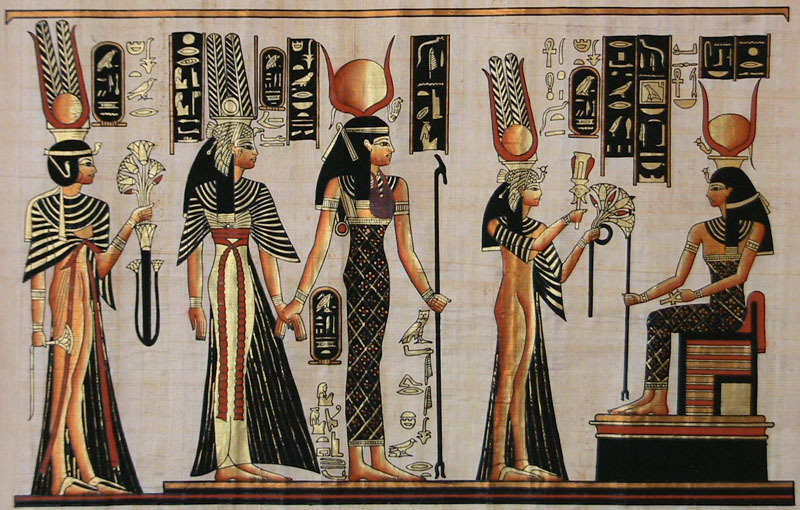 The Egyptian religion recognized a multitude of gods. Their relative importance was influenced by social conditions and subject to political changes. The beginnings of the Egyptian religion can be traced to the fourth millennium B.C. At first, the gods took the form of animals, but later they also assumed human form. Often they were represented as hybrid creatures, for example the falcon-headed god Horus, or the ram-headed god 7 Amun. Among countless deities, the gods associated with the most important religious centers and the major cities always held a special significance. They were honored across the kingdom, thus asserting a cultural and geographical hierarchy within the framework of the official cult. In the Old Kingdom the sun god Re of Heliopolis, near the capital of Memphis, stood out above all others. With the rise of Thebes during the Middle Kingdom, the city's local god Amun was elevated to the foremost rank of the deities and was then fused with Re to become Amun-Re. Pharaoh Akhenaton attempted unsuccessfully to enforce the worship of Aten, who was not represented in a humanoid form but only by the abstract symbol of a sun disk. The Egyptians believed that the gods, too, aged and died. 8 Osiris, represented as a mummy, symbolized death. 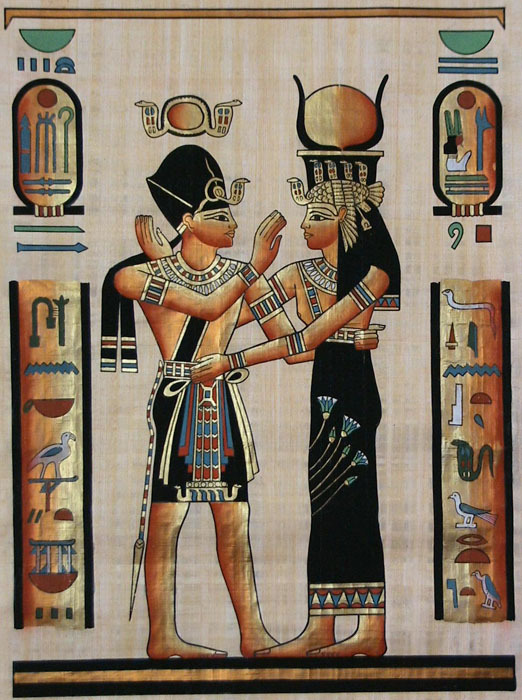 He was killed and dismembered by his brother, the desert-god Seth, but was resurrected by his sister 9, 10 Isis. 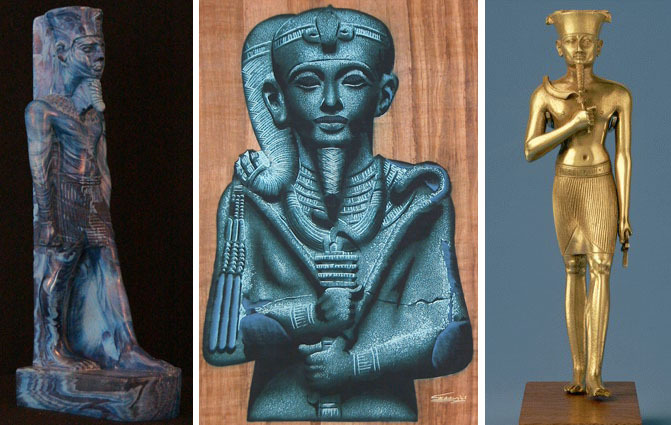 Osiris was thus also a symbol of 11 fertility and lifegiving energy The first pharaohs were considered to be representatives of Horus, the son of Isis and Osiris. In the late Old Kingdom references first appear to a tribunal of the dead, where all the dead must account for their actions before Osiris and Re�either to continue to exist as blessed dead or to be damned, the punishment for which was severe and could mean obliteration. Mummification, burial objects, and tombs such as the pyramids were meant to make the continuation of earthly life possible after death. 12 Rituals and incantations were performed for the protection of the dead. 7 Statue of the ram-headed god Amun, third century B.C. 8 The god Osiris, Egyptian mural, ca. 1306 B.C. 9 Enthroned Isis breast-feeds a young Horus, seventh �. �.�. 11 Seed bed in the form of Osiris, second century B.C. 12 Group of mourners, mural, ca.1370 B.C. Egyptians used amulets and lucky charms such as 6 scarabs to ward off danger or to encourage fertility. The role played by the pharaoh, that of a link between men and gods, decreased with the fall of the New Kingdom and the disintegration of the power. Certain kinds of animals, such as cats and crocodiles, came to be venerated as spiritual mediators. Many of these animals were mummified after death and buried in graveyards or tombs. In the Late Kingdom, Greek influence led to the development of arcane cults, above all those of Isis and Osiris, that would later be popular in the Roman Empire. Egyptian religious beliefs and practices were closely integrated into Egyptian society of the historical period (from c. 3000 bce). Although there were probably many survivals from prehistory, these may be relatively unimportant for understanding later times, because the transformation that established the Egyptian state created a new context for religion. Religious phenomena were pervasive, so much so that it is not meaningful to view religion as a single entity that cohered as a system. Nevertheless, religion must be seen against a background of potentially nonreligious human activities and values. During its more than 3,000 years of development, Egyptian religion underwent significant changes of emphasis and practice, but in all periods religion had a clear consistency in character and style. It is inappropriate to define religion narrowly, as consisting only in the cult of the gods and in human piety. Religious behaviour encompassed contact with the dead, practices such as divination and oracles, and magic, which mostly exploited divine instruments and associations. There were two essential foci of public religion: the king and the gods. Both are among the most characteristic features of Egyptian civilization. The king had a unique status between humanity and the gods, partook in the world of the gods, and constructed great, religiously motivated funerary monuments for his afterlife. Egyptian gods are renowned for their wide variety of forms, including animal forms and mixed forms with an animal head on a human body. The most important deities were the sun god, who had several names and aspects and was associated with many supernatural beings in a solar cycle modeled on the alternation of night and day, and Osiris, the god of the dead and ruler of the underworld. With his consort, Isis, Osiris became dominant in many contexts during the 1st millennium bce, when solar worship was in relative decline. The Egyptians conceived of the cosmos as including the gods and the present world�whose centre was, of course, Egypt�and as being surrounded by the realm of disorder, from which order had arisen and to which it would finally revert. Disorder had to be kept at bay. The task of the king as the protagonist of human society was to retain the benevolence of the gods in maintaining order against disorder. This ultimately pessimistic view of the cosmos was associated principally with the sun god and the solar cycle. It formed a powerful legitimation of king and elite in their task of preserving order. Despite this pessimism, the official presentation of the cosmos on the monuments was positive and optimistic, showing the king and the gods in perpetual reciprocity and harmony. This implied contrast reaffirmed the fragile order. The restricted character of the monuments was also fundamental to a system of decorum that defined what could be shown, in what way it could be shown, and in what context. Decorum and the affirmation of order reinforced each other. These beliefs are known from monuments and documents created by and for the king and the small elite. The beliefs and practices of the rest of the people are poorly known. While there is no reason to believe that there was a radical opposition between the beliefs of the elite and those of others, this possibility cannot be ruled out. The only extensive contemporaneous descriptions of ancient Egyptian culture from the outside were made by Classical Greek and Roman writers. Their works include many important observations about Egyptian religion, which particularly interested the writers and which until late antiquity was not fundamentally different in type from their own religions. Herodotus (5th century bce) remarked that the Egyptians were the most religious of people, and the comment is apt because popular religious practices proliferated in the 1st millennium bce. Other significant Classical sources include Plutarch�s essay on Isis and Osiris (1st century ce), which gives the only known connected narrative of their myth, and the writings of Apuleius (2nd century ce) and others about the Isis cult as it spread in the Greco-Roman world. In other respects, ancient Egypt has been recovered archaeologically. Excavation and the recording of buildings have produced a great range of material, from large monuments to small objects and texts on perishable papyrus. Egyptian monuments are almost unique in the amount of inscription they bear; vast numbers of texts and representations with religious content are preserved, especially from the later 2nd and 1st millennia bce. Much of this material is religious or has religious implications. This dominance may be misleading, partly because many monuments were in the desert, where they are well preserved, and partly because the lavishing of great resources on religious monuments for the king and the gods need not mean that people�s lives were dominated by religion. In addition to favouring large monuments and the elite, the archaeological record has other important biases. The formal cults of major deities and the realm of the dead are far better known than everyday religious activities, particularly those occurring in towns and villages, very few of which have been excavated. The absence of material deriving from the religious practice of most people in itself constitutes evidence suggesting both the inequality of society and the possibility, confirmed by other strands of evidence, that many people�s religious life did not focus on official cult places and major temples. Many official works of art present standard conceptions of the divine world and of the king�s role in this world and in caring for the gods. Much religious evidence is at the same time artistic, and the production of works of art was a vital prestige concern of king and elite. Religious activities and rituals are less well known than this formalized artistic presentation of religious conceptions. The status of personal religion in the context of official cults is poorly understood. Official forms were idealizing, and the untoward, which is everywhere an important focus of religion, was excluded almost entirely from them. The world of the monuments is that of Egypt alone, even though the Egyptians had normal, sometimes reciprocal, relations with other peoples. Decorum affected what was shown. Thus, the king was almost always depicted as the person offering to the gods, although temple rituals were performed by priests. Scenes of offering and of the gods conferring benefits on the king may not depict specific rituals, while the equal form in which king and gods are depicted bears no direct relation to real cult actions, which were performed on small cult images kept inside shrines. An additional limitation is that knowledge of many central concerns was restricted. The king was stated to be alone in knowing aspects of the solar cycle. Knowledge of some religious texts was reserved to initiates, who would benefit from them both in this life and in the next. Magic evoked the power of the exotic and esoteric. Evidence for some restricted material is preserved, but it is not known who had access to it, while in other cases the restricted knowledge is only alluded to and is now inaccessible. Death and the next world dominate both the archaeological record and popular modern conceptions of Egyptian religion. This dominance is determined to a great extent by the landscape of the country, since tombs were placed if possible in the desert. Vast resources were expended on creating prestigious burial places for absolute rulers or wealthy officials. Tombs contained elaborate grave goods (mostly plundered soon after deposition), representations of �daily life,� or less commonly of religious subjects, and some texts that were intended to help the deceased attain the next world and prosper there. The texts came increasingly to be inscribed on coffins and stone sarcophagi or deposited in burials on papyrus. Some royal tombs included long passages from religious texts, many of them drawn from nonmortuary contexts and hence more broadly valuable as source material. One crucial area where religion extended beyond narrow bounds was in the ethical instructions, which became the principal genre of Egyptian literature. These are known from the Middle Kingdom (c. 1900�1600 bce) to the Roman period (1st century ce). As with other sources, the later texts are more overtly religious, but all show inextricable connections between proper conduct, the order of the world, and the gods. The king was the centre of human society, the guarantor of order for the gods, the recipient of god-given benefits including life itself, and the benevolent ruler of the world for humanity. He was ultimately responsible for the cults of the dead, both for his predecessors in office and for the dead in general. His dominance in religion corresponded to his central political role: from late predynastic times (c. 3100 bce), state organization was based on kingship and on the service of officials for the king. For humanity, the king had a superhuman role, being a manifestation of a god or of various deities on earth. 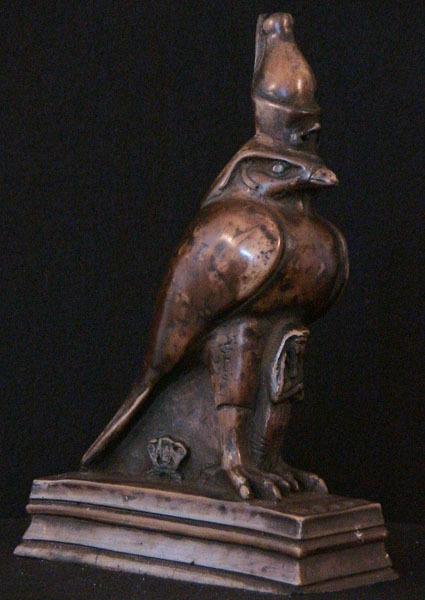 The king�s principal original title, the Horus name, proclaimed that he was an aspect of the chief god Horus, a sky god who was depicted as a falcon. Other identifications were added to this one, notably �Son of Re� (the sun god) and �Perfect God,� both introduced in the 4th dynasty (c. 2575�2465 bce), when the great pyramids were constructed. The epithet �Son of Re� placed the king in a close but dependent relation with the leading figure in the pantheon. �Perfect God� (often rendered �Good God�) indicated that the king had the status of a minor deity, for which he was �perfected� through accession to his office; it restricted the extent of his divinity and separated him from full deities. In his intermediate position between humanity and the gods, the king could receive the most extravagant divine adulation and was in some ways more prominent than any single god. In death he aspired to full divinity but could not escape the human context. Although royal funerary monuments differed in type from other tombs and were vastly larger, they too were pillaged and vandalized, and few royal mortuary cults were long-lasting. Some kings, notably Amenhotep III (1390�53 bce), Ramses II (1279�13 bce), and several of the Ptolemies, sought deification during their own lifetime, while others, such as Amenemhet III (1818�c. 1770 bce), became minor gods after their death, but these developments show how restricted royal divinity was. The divinized king coexisted with his mortal self, and as many nonroyal individuals as kings became deified after death. The gods, the king, humanity, and the dead existed together in the cosmos, which the creator god had brought into being from the preexistent chaos. All living beings, except perhaps the creator, would die at the end of time. The sun god became aged and needed to be rejuvenated and reborn daily. The ordered cosmos was surrounded by and shot through with disorder, which had to be kept at bay. Disorder menaced most strongly at such times of transition as the passage from one year to the next or the death of a king. Thus, the king�s role in maintaining order was cosmic and not merely social. His exaction of service from people was necessary to the cosmos. The concept of maat (�order�) was fundamental in Egyptian thought. 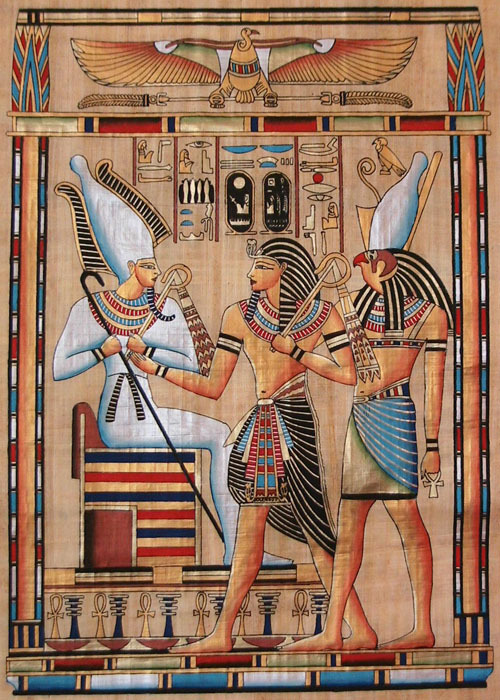 The king�s role was to set maat in place of isfet (�disorder�). Maat was crucial in human life and embraced notions of reciprocity, justice, truth, and moderation. 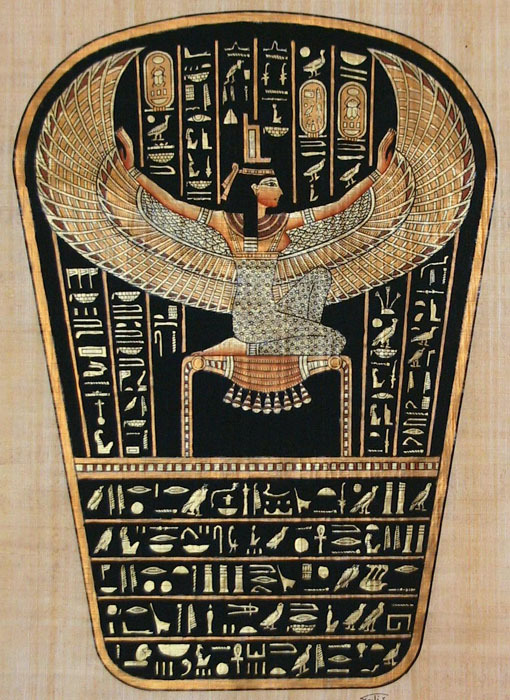 Maat was personified as a goddess and the creator�s daughter and received a cult of her own. 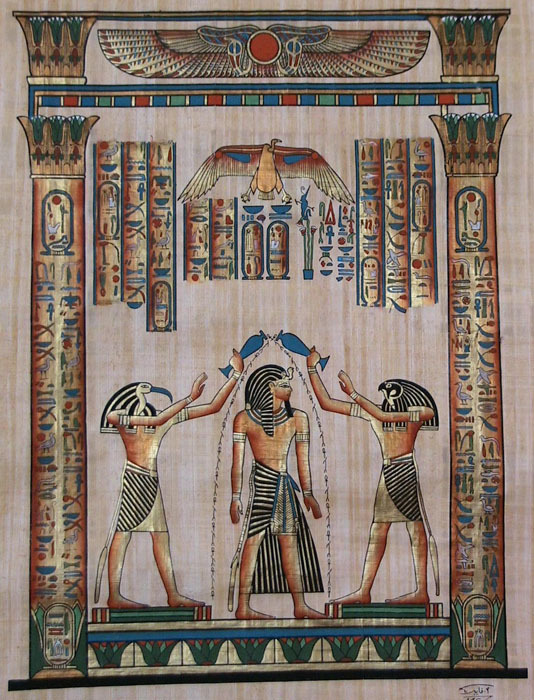 In the cult of other deities, the king�s offering of maat to a deity encapsulated the relationship between humanity, the king, and the gods; as the representative of humanity, he returned to the gods the order that came from them and of which they were themselves part. Maat extended into the world of the dead: in the weighing of the heart after death, shown on papyri deposited in burials, the person�s heart occupies one side of the scales and a representation of maat the other. The meaning of this image is deepened in the accompanying text, which asserts that the deceased behaved correctly on earth and did not overstep the boundaries of order, declaring that he or she did not �know that which is not��that is, things that were outside the created and ordered world. This role of maat in human life created a continuity between religion, political action, and elite morality. Over the centuries, private religion and morality drew apart from state concerns, paralleling a gradual separation of king and temple. It cannot be known whether religion and morality were as closely integrated for the people as they were for the elite, or even how fully the elite subscribed to these beliefs. Nonetheless, the integration of cosmos, king, and maat remained fundamental. Egyptian religion was polytheistic. The gods who inhabited the bounded and ultimately perishable cosmos varied in nature and capacity. The word netjer (�god�) described a much wider range of beings than the deities of monotheistic religions, including what might be termed demons. As is almost necessary in polytheism, gods were neither all-powerful nor all-knowing. Their power was immeasurably greater than that of human beings, and they had the ability to live almost indefinitely, to survive fatal wounds, to be in more than one place at once, to affect people in visible and invisible ways, and so forth. Most gods were generally benevolent, but their favour could not be counted on, and they had to be propitiated and encouraged to inhabit their cult images so that they could receive the cult and further the reciprocity of divine and human. Some deities, notably such goddesses as Neith, Sekhmet, and Mut, had strongly ambivalent characters. The god Seth embodied the disordered aspects of the ordered world, and in the 1st millennium bce he came to be seen as an enemy who had to be eliminated (but would remain present). The characters of the gods were not neatly defined. Most had a principal association, such as that of Re with the sun or that of the goddess Hathor with women, but there was much overlap, especially among the leading deities. In general, the more closely circumscribed a deity�s character, the less powerful that deity was. All the main gods acquired the characteristics of creator gods. A single figure could have many names; among those of the sun god, the most important were Khepri (the morning form), Re-Harakhty (a form of Re associated with Horus), and Atum (the old, evening form). There were three principal �social� categories of deity: gods, goddesses, and youthful deities, mostly male. Gods had regional associations, corresponding to their chief cult places. The sun god�s cult place was Heliopolis, Ptah�s was Memphis, and Amon�s was Thebes. These were not necessarily their original cult places. The principal cult of Khnum, the creator god who formed people from clay like a potter, was Elephantine, and he was the lord of the nearby First Cataract. His cult is not attested there before the New Kingdom, however, even though he was important from the 1st dynasty (c. 2925�2775 bce). The main earlier sanctuary there belonged to the goddess Satet, who became Khnum�s companion. 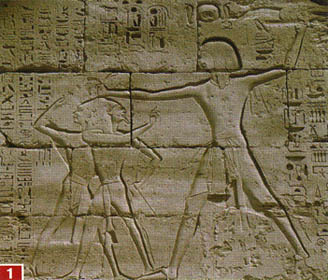 Similarly, Mut, the partner of Amon at Thebes, seems to have originated elsewhere. Deities had principal manifestations, and most were associated with one or more species of animal. For gods the most important forms were the falcon and bull, and for goddesses the cow, cobra, vulture, and lioness. Rams were widespread, while some manifestations were as modest as the millipede of the god Sepa. Some gods were very strongly linked to particular animals, as Sebek was with the crocodile and Khepri with the scarab beetle. Thoth had two animals, the ibis and the baboon. Some animal cults were only partly integrated with specific gods, notably the Ram of Mendes in the Delta and the Apis and Mnevis bulls at Memphis and Heliopolis, respectively. Animals could express aspects of a deity�s nature: some goddesses were lionesses in their fiercer aspect but were cats when mild. These variable forms relate to aspects of the person that were common to gods and people. The most significant of these were the ka, which was the vital essence of a person that was transmitted from one generation to the next, the ba, which granted freedom of movement and the ability to take on different forms, principally in the next world, and the akh, the transfigured spirit of a person in the next world. The chief form in which gods were represented was human, and many deities had only human form. Among these deities were very ancient figures such as the fertility god Min and the creator and craftsman Ptah. 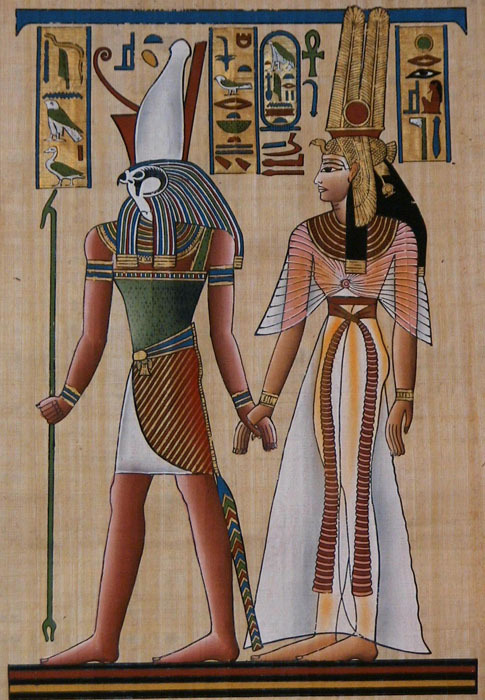 The cosmic gods Shu, of the air and sky, and Geb, of the earth, had human form, as did Osiris, Isis, and Nephthys, deities who provided a model of human society. In temple reliefs the gods were depicted in human form, which was central to decorum. Gods having animal manifestations were therefore shown with a human body and the head of their animal. 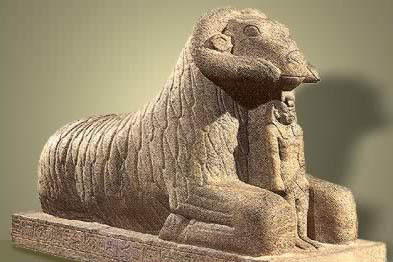 The opposite convention, a human head and an animal body, was used for the king, who was shown as a sphinx with a lion�s body. 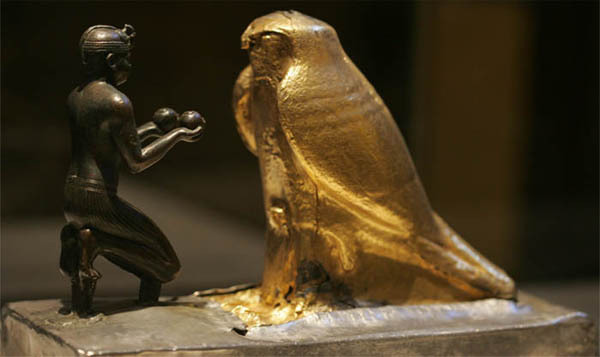 Sphinxes could receive other heads, notably those of rams and falcons, associating the form with Amon and Re-Harakhty. Demons were represented in more extravagant forms and combinations; these became common in the 1st millennium bce. Together with the cult of animals, they were mocked by Greek and Roman writers. Apart from major deities�gods who received a cult or had a significant cosmic role�there were important minor figures. Several of these marginal beings had grotesque forms and variable names. The most prominent were Bes, a helpful figure with dwarf form and a masklike face, associated especially with women and children, and Taurt, a goddess with similar associations whose physical form combined features of a hippopotamus and a crocodile. Among demons, the most important figure was Apopis, shown as a colossal snake, who was the enemy of the sun god in his daily cycle through the cosmos. Apopis existed outside the ordered realm; he had to be defeated daily, but, since he did not belong to the sphere of existence, he could not be destroyed. The number of deities was large and was not fixed. New ones appeared, and some ceased to be worshipped. Deities were grouped in various ways. The most ancient known grouping is the ennead, which is probably attested from the 3rd dynasty (c. 2650�2575 bce). Enneads were groups of nine deities, nine being the �plural� of three (in Egypt the number three symbolized plurality in general); not all enneads consisted of nine gods. The principal ennead was the Great Ennead of Heliopolis. This was headed by the sun god and creator Re or Re-Atum, followed by Shu and Tefnut, deities of air and moisture; Geb and Nut, who represented earth and sky; and Osiris, Isis, Seth, and Nephthys. 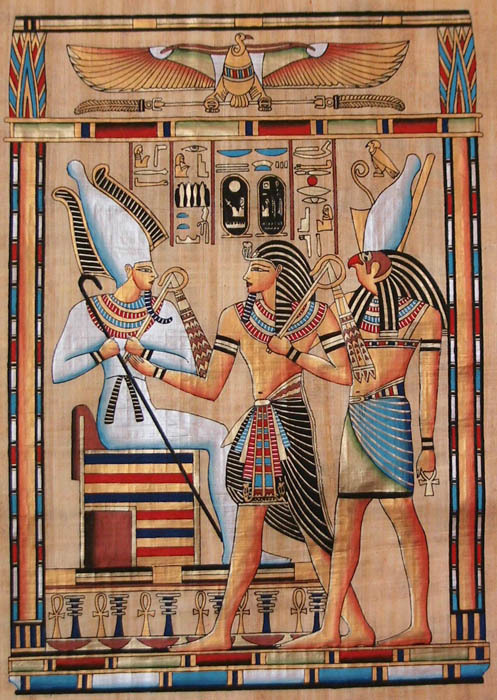 This ordering incorporated a myth of creation, to which was joined the myth of Osiris, whose deeds and attributes ranged from the founding of civilization to kinship, kingship, and succession to office. The ennead excluded the successor figure, Horus, son of Osiris, who is essential to the meaning of the myth. Thus, the ennead has the appearance of a grouping that brought together existing religious conceptions but was rather arbitrary and inflexible, perhaps because of the significance of the number nine. Other numerical ordering schemas included the Ogdoad (group of eight gods) of Hermopolis, which embodied the inchoate world before creation and consisted of four pairs of male and female deities with abstract names such as Darkness, Absence, and Endlessness. Here too the number was significant in itself, because at least six different pairs of names are known although eight deities are listed in any occurrence. The major god Amon, whose name can mean �He who is hidden,� was often one of the ogdoad with his female counterpart, Amaunet. The most common grouping, principally in the New Kingdom and later, was the triad. 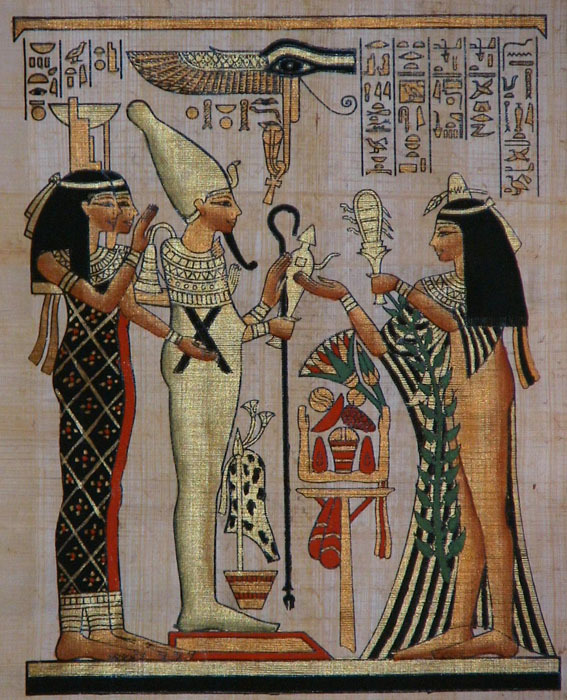 The archetypal triad of Osiris, Isis, and Horus exhibits the normal pattern of a god and a goddess with a youthful deity, usually male. Most local centres came to have triads, the second and third members of which might be devised for the sake of form. Thus, one triad worshipped in the Greco-Roman-period temple at Kawm Umbū (Kôm Ombo) consisted of Haroeris (the �elder Horus�), the goddess Tsenetnofret (�the perfect companion�), and the youthful god Pnebtawy (�the lord of the two lands�). The last name, which is an epithet of kings, is revealing, because youthful gods had many attributes of kings. As this case indicates, triads resemble a minimal nuclear family, but deities were rarely spouses. The notion of plurality and the bringing together of the essential types of deity may have been as important to the triads as the family analogy. Another important ordering of deities was syncretism, a term with a special meaning for Egyptian religion. Two or more names of gods were often combined to form a composite identity; many combinations included the name of Re. Prominent examples are Amon-Re, a fusion of Amon and Re, and Osiris-Apis, a fusion of Osiris with the Apis Bull. Although composite forms such as Amon-Re became the principal identities of some gods, the separate deities continued to exist and sometimes, as in the case of Re, to receive a cult. In part, these syncretisms expressed the idea of Amon in his aspect as Re; they were thus analogous to the multiple manifestations of individual deities. Through syncretism many major deities came to resemble one another more closely. Myths are poorly known. Religious discourse was recorded in hymns, rituals, temple scenes, and specialized texts but rarely in narrative, which only slowly became a common written genre and never had the highest literary prestige. In addition, much religious activity focused on constant reiteration or repetition rather than on development. A central example of this tendency is the presentation of the cycle of the sun god through the sky and the underworld, which was an analogy for the creation, maturity, decay, and regeneration of an individual life and of the cosmos. This is strikingly presented in the underworld books. These pictorial and textual compositions, which probably imparted secret knowledge, were inscribed in the tombs of New Kingdom kings. They describe the solar cycle in great detail, including hundreds of names of demons and of deities and other beings who accompanied the sun god in his barque on his journey through night and day. The texts are in the present tense and form a description and a series of tableaux rather than a narrative. The fact that mythical narratives are rare does not imply that myths or narratives did not exist. There is reason to think that some myths underlay features of enneads and therefore had originated by the Early Dynastic period (c. 3000 bce). Mythical narratives preserved from the New Kingdom and later include episodes of the rule of the sun god on earth, tales of the childhood of Horus in the delta marshes, and stories with themes similar to the Osiris myth but with differently named protagonists. The rule of the sun god was followed by his withdrawal into the sky, leaving people on earth. The withdrawal was motivated by his age and by the lack of tranquility in the world. One narrative recounts how Isis obtained a magical substance from Re�s senile dribbling and fashioned from it a snake that bit him; to make her still the agony of the snakebite, he finally revealed to her the secret of his �true� name. A myth with varied realizations recounts how Re grew weary of humanity�s recalcitrance and dispatched his daughter or �Eye� to destroy them. Regretting his action later, he arranged to have the bloodthirsty goddess tricked into drunkenness by spreading beer tinted the colour of blood over the land. This myth provides an explanation for the world�s imperfection and the inaccessibility of the gods. In Greco-Roman times it was widespread in Lower Nubia, where it seems to have been related to the winter retreat of the sun to the Southern Hemisphere and its return in the spring. Most cults centred on the daily tending and worship of an image of a deity and were analogous to the pattern of human life. The shrine containing the image was opened at dawn, and then the deity was purified, greeted and praised, clothed, and fed. There were several further services, and the image was finally returned to its shrine for the night. Apart from this activity, which took place within the temple and was performed by a small group of priests, there were numerous festivals at which the shrine and image were taken out from the sanctuary on a portable barque, becoming visible to the people and often visiting other temples. Thus, the daily cult was a state concern, whose function was to maintain reciprocity between the human and the divine, largely in isolation from the people. This reciprocity was fundamental because deities and humanity together sustained the cosmos. If the gods were not satisfied, they might cease to inhabit their images and retreat to their other abode, the sky. Temples were constructed as microcosms whose purity and wholeness symbolized the proper order of the larger world outside. The priesthood became increasingly important. In early periods there seem to have been no full-time professional priests; people could hold part-time high priestly offices, or they could have humbler positions on a rotating basis, performing duties for one month in four. The chief officiant may have been a professional. While performing their duties, priests submitted to rules of purity and abstinence. One result of this system was that more people were involved in the cult and had access to the temple than would have been the case if there had been a permanent staff. Although most priestly positions were for men, women were involved in the cult of the goddess Hathor, and in the New Kingdom and later many women held the title of �chantress� of a deity (perhaps often a courtesy title); they were principally involved in musical cult performances. Festivals allowed more-direct interaction between people and the gods. Questions were often asked of a deity, and a response might be given by a forward or backward movement of the barque carried on the priests� shoulders. Oracles, of which this was one form, were invoked by the king to obtain sanction for his plans, including military campaigns abroad and important appointments. Although evidence is sparse, consultation with deities may have been part of religious interaction in all periods and for all levels of society. Apart from this interaction between deities and individual people or groups, festivals were times of communal celebration, and often of the public reenactment of myths such as the death and vindication of Osiris at Abydos or the defeat of Seth by Horus at Idfū. They had both a personal and a general social role in the spectrum of religious practice. Nonetheless, the main audience for the most important festivals of the principal gods of state held in capital cities may have been the ruling elite rather than the people as a whole. In the New Kingdom these cities were remodeled as vast cosmic stages for the enactment of royal-divine relations and rituals. Despite the importance of temples and their architectural dominance, the evidence for cult does not point to mass participation in temple religion. The archaeological material may be misleading, because in addition to major temples there were many local sanctuaries that may have responded more directly to the concerns and needs of those who lived around them. From some periods numerous votive offerings are preserved from a few temples. Among these are Early Dynastic and Old Kingdom provincial temples, but the fullest evidence is from New Kingdom temples of Hathor at Thebes and several frontier sites and from the Late and Ptolemaic periods (664�30 bce). Although votive offerings show that significant numbers of people took gifts to temples, it is difficult to gauge the social status of donors, whose intentions are seldom indicated, probably in part for reasons of decorum. Two likely motives are disinterested pious donation for the deity and offering in the hope of obtaining a specific benefit. 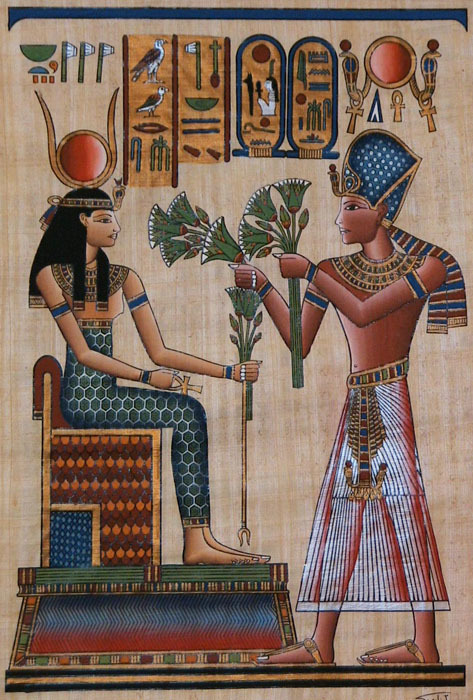 Many New Kingdom offerings to Hathor relate to human fertility and thus belong to the second of these categories. Late period bronze statuettes are often inscribed with a formula requesting that the deity represented should �give life� to the donor, without stating a specific need. These may be more generally pious donations, among which can also be counted nonroyal dedications of small parcels of land to temples. These donations are recorded on stelae from the New Kingdom onward. They parallel the massive royal endowments to temples of land and other resources, which resulted in their becoming very powerful economic and political institutions. Apart from the donation of offerings to conventional cult temples, there was a vast Late period expansion in animal cults. These might be more or less closely related to major deities. They involved a variety of practices centring on the mummification and burial of animals. The principal bull cults, which gave important oracles, focused on a single animal kept in a special shrine. The burial of an Apis bull was a major occasion involving vast expenditure. 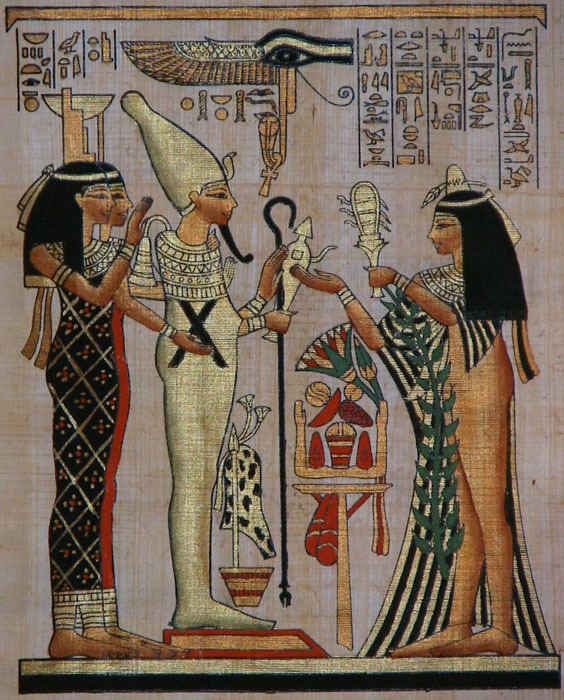 Some animals, such as the sacred ibis (connected with Thoth), were kept, and buried, in millions. The dedication of a burial seems to have counted as a pious act. The best-known area for these cults and associated practices is the necropolis of northern Ṣaqqārah, which served the city of Memphis. Numerous species were buried there, and people visited the area to consult oracles and to spend the night in a temple area and receive healing dreams. A few people resided permanently in the animal necropolis in a state akin to monastic seclusion. There are two further important groups of evidence for pious and reciprocal relations between people and gods. One is proper names of all periods, the majority of which are meaningful utterances with religious content. For example, names state that deities �show favour� to or �love� a child or its parents. From the end of the New Kingdom (c. 1100 bce), names commonly refer to consultation of oracles during pregnancy, alluding to a different mode of human-divine relations. The second source is a group of late New Kingdom inscriptions recounting episodes of affliction that led to people�s perceiving that they had wronged a god. These texts, which provide evidence of direct pious relations, are often thought to show a transformation of religious attitudes in that period, but allusions to similar relations in Middle Kingdom texts suggest that the change was as much in what was written down as in basic attitudes. Piety was one of many modes of religious action and relations. Much of religion concerned attempts to comprehend and respond to the unpredictable and the unfortunate. The activities involved often took place away from temples and are little known. In later periods, there was an increasing concentration of religious practice around temples; for earlier times evidence is sparse. The essential questions people asked, as in many religious traditions, were why something had happened and why it had happened to them, what would be an appropriate response, what agency they should turn to, and what might happen in the future. To obtain answers to these questions, people turned to oracles and to other forms of divination, such as consulting seers or calendars of lucky and unlucky days. From the New Kingdom and later, questions to oracles are preserved, often on such mundane matters as whether someone should cultivate a particular field in a given year. These cannot have been presented only at festivals, and priests must have addressed oracular questions to gods within their sanctuaries. Oracles of gods also played an important part in dispute settlement and litigation in some communities. A vital focus of questioning was the world of the dead. The recently deceased might exert influence on the living for good or for bad. Offerings to the dead, which were required by custom, were intended, among other purposes, to make them well disposed. People occasionally deposited with their offerings a letter telling the deceased of their problems and asking for assistance. A few of these letters are complaints to the deceased person, alleging that he or she is afflicting the writer. This written communication with the dead was confined to the very few literate members of the population, but it was probably part of a more widespread oral practice. Some tombs of prominent people acquired minor cults that may have originated in frequent successful recourse to them for assistance. Offerings to the dead generally did not continue long after burial, and most tombs were robbed within a generation or so. Thus, relations with dead kin probably focused on the recently deceased. Nonetheless, the dead were respected and feared more widely. The attitudes attested are almost uniformly negative. The dead were held accountable for much misfortune, both on a local and domestic level and in the broader context of the state. People were also concerned that, when they died, those in the next world would oppose their entry to it as newcomers who might oust the less recently dead. These attitudes show that, among many possible modes of existence after death, an important conception was one in which the dead remained near the living and could return and disturb them. Such beliefs are rare in the official mortuary literature. A prominent aspect of practical religion was magic. There is no meaningful distinction between Egyptian religion and magic. Magic was a force present in the world from the beginning of creation and was personified as the god Heka, who received a cult in some regions. Magic could be invoked by using appropriate means and was generally positive, being valuable for counteracting misfortune and in seeking to achieve ends for which unseen help was necessary. Magic also formed part of the official cult. It could, however, be used for antisocial purposes as well as benign ones. There is a vast range of evidence for magical practice, from amulets to elaborate texts. Much magic from the Greco-Roman period mixed Egyptian and foreign materials and invoked new and exotic beings. Preserved magical texts record elite magic rather than general practice. Prominent among magical practitioners, both in folklore and, probably, in real life, were �lector priests,� the officiants in temple cults who had privileged access to written texts. Most of the vast corpus of funerary texts was magical in character. It was thought that the next world might be located in the area around the tomb (and consequently near the living); on the �perfect ways of the West,� as it is expressed in Old Kingdom invocations; among the stars or in the celestial regions with the sun god; or in the underworld, the domain of Osiris. One prominent notion was that of the �Elysian Fields,� where the deceased could enjoy an ideal agricultural existence in a marshy land of plenty. The journey to the next world was fraught with obstacles. It could be imagined as a passage by ferry past a succession of portals, or through an �Island of Fire.� One crucial test was the judgment after death, a subject often depicted from the New Kingdom onward. The date of origin of this belief is uncertain, but it was probably no later than the late Old Kingdom. The related text, Chapter 125 of the Book of the Dead, responded magically to the dangers of the judgment, which assessed the deceased�s conformity with maat. Those who failed the judgment would �die a second time� and would be cast outside the ordered cosmos. In the demotic story of Setna (3rd century bce), this notion of moral retribution acquired overtones similar to those of the Christian judgment after death.